A subsidiary of alternative mortgage lender Home Capital has struck a deal to sell $1.5 billion worth of mortgage commitments and renewals to an unnamed buyer. 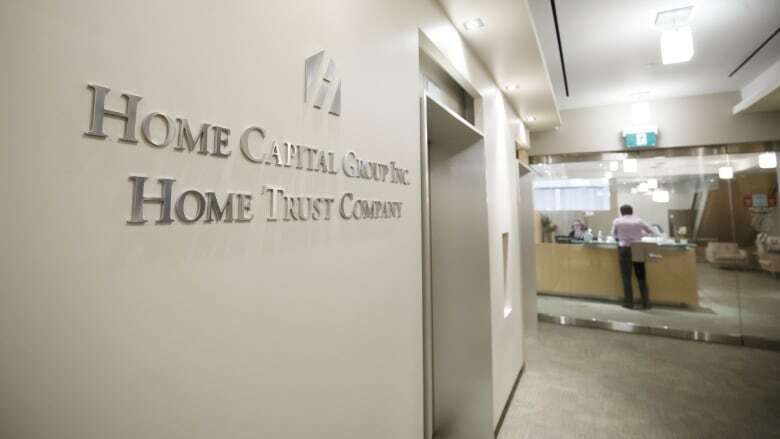 Home Trust, a division of Home Capital licensed to conduct business across Canada, announced the move in a news release early Tuesday. Buy up to $1 billion worth of uninsured mortgages, up to half of which would come immediately via existing commitments and/or mortgage renewals. Buy an additional $500 million worth of insured mortgages, provided they have proper documentation. The stock surged almost 30 per cent on Tuesday, adding $2.03 to close at $8.86 on the TSX. That follows a 16 per cent surge on Monday when the company named three new members to its board of directors. But that rally comes after the company had lost more than three-quarters of its value in the preceding weeks, ever since the Ontario Securities Commission announced a probe into how it conducted itself several years ago when numerous mortgages brokers were caught pushing bogus paperwork for prospective homebuyers. Home Capital said it stopped working with about 45 such brokers in 2015, but the OSC's move this week prompted a run on the bank and questions about Home Capital's ability to stay in business. Home Capital disputes those allegations. Home Capital makes money by taking deposits from savers, and lending them out in mortgages to people the big banks don't generally want to lend to because they have a poor credit history or otherwise uneven incomes. As of Monday, Home Trust had $146 million left in its savings accounts. At the end of the March, that figure was around $2 billion. Questions about the company's future have prompted savers to pull their money out of the bank en masse of late, fearing it may go under. That compelled Home Capital to take out a loan with an interest rate of up to 22 per cent last month, and Tuesday's move is a further step toward raising money in the short term until the company can come up with a permanent solution. While the company insisted in a release Tuesday that its "existing mortgage portfolio continues to perform well," Home Capital says in the near future it will move away from keeping the mortgages it issues on its books. Instead, the company plans to keep giving out mortgages, but then turning around and selling them to someone else — just as they are doing in the deal announced Tuesday. "This will result in lower overall mortgage balances, increased costs and reduced levels of profitability in the near term," Home Capital said. But interim CEO Bonita Then added "we are optimistic that there can be opportunities for future growth." Stock analysts who cover the company said the move was good news for the company, but doesn't completely clear up the uncertainty. TD Bank analyst Graham Ryding said a business model built around loaning people money to buy home and then reselling the actual mortgages to other banks is doable, but "at this point we do not have the visibility to determine if this is a sustainable and profitable arrangement going forward." Laurentian Bank analyst Marc Charbin said the sale is "good in light of declining deposits," but the company's expectations of giving out fewer mortgages and paying higher costs to do so aren't an encouraging sign. The company is set to reveal its quarterly earnings after the stock market closes on Thursday.